Every tourist in South Africa is confronted with the term fynbos. There are hiking trails fynbos, fynbos trails, fynbos books and numerous brand names. Fynbos, translated the name means "fine bush" and describes the numerous low shrubs and bushes that dot the mountains and plains to the sea, and it is in its biodiversity world wide unmatched. A specialty among the many flowering fynbos species is the protea by far. Proteaceae (Proteaceae) are almost exclusively native to South Africa and Australia, and its name derives from the Greek god Proteus. But 85 of different Protea’s are found in the Cape. They grow in all mountain areas in places that are not too dry or too moist. Proteas are found from Port Elizabeth in the east of the Garden Route to the west coast to the north of Vanrhynsdorp Lamberts Bay. They inhabit coastal landscapes as well. The Magnificent Königsprotea (Protea cynaroides) is quite rightly the national flower of South Africa. With thick bark on their branches, it is fairly resistant to bush fires. A shrub is 1-3 meters high. The lush blooms are similar to a thistle, they come in many colors from white to silver, red, pink, yellow and even green. Mediterranean climate with dry summers are present at the southwestern Cape and cool, moist winters. 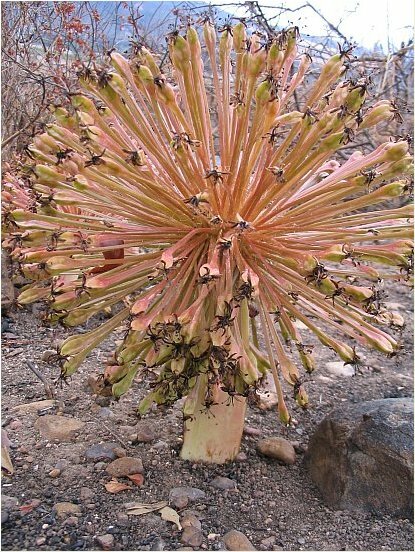 Nevertheless, the floral kingdom, grows under conditions similar to those in the Mediterranean, unique in the world. There are 6 floral kingdoms in the world, here is the smallest, but it has the greatest variety. Many of the 8,500 plant species are found only here. Occasional fires, the cause of diversity and fertility, is an important key factor for the fynbos ecology. Some plants germinate only after a fire. Ants are also important in this particular ecology, because they spread the fire-resistant seeds in their lives radius. Thus, the distribution of plants is very limited, and some endemic species grow only in very limited areas, sometimes just a football field in size. after the land is exposed to fire.